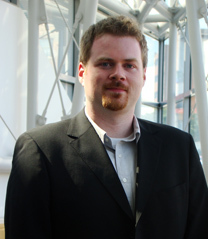 Former ISR postdoctoral researcher Matthew McCarthy has been promoted to Associate Professor with tenure at Drexel University in Philadelphia. McCarthy is a faculty member in the Mechanical Engineering & Mechanics Department where he directs the Multiscale Thermofluidics Laboratory. He is a former postdoctoral researcher of ISR Director Reza Ghodssi (ECE/ISR). At Maryland, McCarthy used the Tobacco mosaic virus to create materials with a “superhydrophobic” surface that mimics the water-resisting properties of wetland plant leaves. The surfaces are fabricated using biological virus nanostructures as self-assembled templates and have a hierarchical structure with both microscale and nanoscale features. Their properties could one day make them useful as coatings on buildings, solar cells, and textiles. In 2015 McCarthy received an NSF CAREER Award for another project involving TMV, Investigation of Boiling Heat Transfer Mechanisms and their Enhancement using Biotemplated Nanostructures. He is leveraging the simplicity and flexibility of biotemplated nanofabrication to investigate fundamental mechanisms by which nanostructured coatings affect liquid-to-vapor phase change during boiling. TMV is being used to fabricate tunable surface structures for novel and probative thermofluidic characterizations, leading to the realization of high-performance surfaces with heterogeneous architectures.